Beginning on AZ Hwy 177 in Superior; southeasterly on AZ Hwy 177 to the Gila River; northeasterly along the Gila River to the San Carlos Indian Reservation boundary; easterly, westerly and northerly along the reservation boundary to the Salt River; southwesterly along the Salt River to AZ Hwy 288; southerly on AZ Hwys 288 and 88 to U.S. Hwy 60; southwesterly on U.S. Hwy 60 to AZ Hwy 177. The major mountain ranges within 24A include the Dripping Springs Mountains and the Mescal Mountains in the southern portion of the unit, the Pinal Mountains south of Globe, the Apache Mountains north of Globe, and the Timber Camp Mountains northeast of Globe. The northern portion of the unit, from the Dripping Springs Road north, is a mix of private property and Tonto National Forest land. The southern portion of the unit is a mix of State Trust Land, BLM land, and private property. Access through most of Dripping Springs, Horseshoe Bend (Forest Road 219) , and Nugget Mesa (Forest Road 580) is a privilege and therefore can be denied due to the private property sections along the road. Please sign into our AZ Game and Fish Sign in boxes at these locations. The sign in box program is a Landowner Access agreement we utilize to allow recreational users to cross through private property without having to contact the landowner each time for permission. By signing in it allows the landowner and LE officials know who is lawfully accessing the property otherwise individuals who fail to do so are in violation of criminal trespass. Overview: Overall, the javelina population has been increasing, but still hasn’t reached numbers this unit has historically supported in the past. Javelina hunting is about average for the unit. Each year, the Department offers an archery-only javelina hunt during the month of January, a primitive weapons hunt (handgun, archery, muzzleloader only) hunt in February, and a general hunt in February. Keep in mind that the following areas are recommended areas to scout and do not guarantee success. Areas: Javelina can be found throughout the unit with the exception of the top of the Pinal Mountains south of Globe. The best way to hunt javelina is to find a high spot where you can see lots open desert hillsides in the mornings and evenings. Glass for javelina on south or west facing slopes and sunny bottomlands early in the morning when javelina are trying to warm themselves. Keep the wind in your face and move reasonably slow when you get within a couple of hundred yards, and you should have no problem getting within range. Dripping Springs Wash: Turn west/northwest on the dripping springs wash road off of Hwy 77 about 15 miles south of Globe. There lots of open desert ridges in this area that lend themselves well to glassing. Horseshoe Bend: Take the Wheatfield’s exit east of Forest Road 219 to the east off of old Hwy 88 just past the HE Ranch. Forest road 219 junctions with FR 220, which travels to Richmond Basin and FR 223, that leads to Shute Springs. Both these areas have javelina and good open slopes for glassing. 7-Mile Wash: There are fewer javelina in 7-Mile Wash in relation to other areas in the unit, but the area still provides a good hunting opportunity. To access this area go north of Globe on Hwy 77 to Forest Road 303. The low rolling hills on both sides of this road in 7-Mile, all the way to the Salt River can hold javelina. El Capitan: Forest Roads 1036, 527, and 2670 have great open slopes to Glass javelina. Explore both sides of Hwy 77, south of Globe. Overview: Similar to mule deer population across the state; Unit 24A mule deer population has been declining since the mid 1990s. Mule deer are found scattered in the lower elevation areas of 24A, and can also occur with white-tailed deer in this unit, so be sure of your target before you shoot. Keep in mind that the following areas are recommended areas to scout and do not guarantee success. Areas: A popular place to find mule deer is in the 7-Mile Wash Road area (Forest Road 303) at the north end of the Apache Mountains. Glass the lower elevation rolling hills for mule deer. Mule deer can also be found in the Dripping Springs wash area. To access this area one can turn west/northwest off State Route 77 about 15 miles south of Globe onto the Dripping Springs Road. Another good area for mule deer is off the Horseshoe Bend Road (FR 219) on the west side of the Apache Mountains. Take the Wheatfields exit from Hwy 188 north of Globe across Pinal Creek and past the HE Ranch to the 219 Road. Forest Road 219 junctions with FR 220 that travels to Richmond Basin and FR 223 that leads to Shute Springs, both areas have mule deer and good open slopes for glassing. Access to these areas is provided across private property so you must sign in and out as you cross private property. 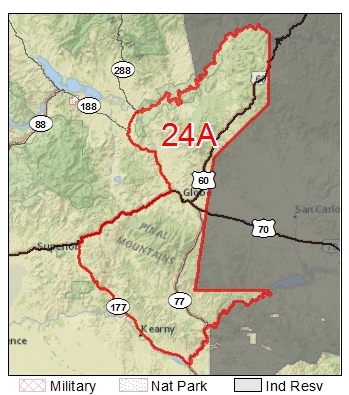 If you plan on hunting the northeast portion of 24A, be aware of the San Carlos Indian Reservation Boundary. Hunting on tribal land is not permitted with an Arizona Game and Fish permit. Over view: Within the past couple of years, whitetail deer have been increasing as a whole in the state and the unit has its opportunities for harvest. Several older age class bucks have been harvested in 24A over the last several years. Keep in mind that the following areas are recommended areas to scout and do not guarantee success. Areas: A good whitetail hunting area in 24A, is found in the Pinal Mountains. The area is rugged and steep and the whitetails are seen primarily in the drainages below the mountain summit. A lot of glassing along with some patience will reveal the deer. Whitetails are found on most slopes of the Pinals, but glassing is difficult on the north side due to thick conifer and chaparral and high hunter concentrations. The high mountain elevation areas of the Dripping Springs Mountains located south of Globe also provide opportunity. The Dripping Springs road can be accessed south of Globe off of Hwy 77 across milepost 154. There are many roads that run north and south along the ridges that provide good glassing opportunities. Forest Roads 248 and 899 are two-trackers leading to the north of Dripping Springs road, and both of those will take you to good deer areas. Any of these roads are likely to lead you to whitetail deer. It is possible to drive from Dripping Springs road thru Pioneer Basin (FR 112) all the way to Pinal Peak, although the road has been washed out and an ATV would be recommended. Be aware that mule deer also occur in these areas; so be sure of your target before you shoot. If you want to hunt the northern portion of the unit, whitetails can be found in the areas of Timber Camp Mountain, Regal Canyon, Phillips Canyon, and Chrysotile Mine Area. Forest Roads 2334, 360 and 304 access these higher elevation grassland and chaparral habitats where whitetail deer have been increasing in numbers. Another area is off the Horseshoe Bend Road (FR 219) on the west side of the Apache Mountains. Take the Wheatfields exit from Hwy 188 north of Globe across Pinal Creek and past the HE Ranch to the 219 Road. FR 219 junctions with FR 220, which travels to Richmond Basin and FR 223, that leads to Shute Springs. Both these areas have whitetail and good open slopes for glassing. Travel by foot or horseback to access the upper slopes of the Apache Mountains for a better chance at older age-class whitetail buck. Overview: Black bear hunting is offered in the spring and in the fall with a majority of the hunt success occurring in the fall. During the fall hunts, bears range widely in search of acorns, juniper berries, manzanita berries, and prickly pear cactus fruit in order to prepare their bodies for winter. Bears are crepuscular meaning they’re active early morning and late afternoon into the evening. Remember that dogs are not allowed in the spring hunt, but are allowed in the fall. Also, baiting bears is illegal regardless of the season. Keep in mind that the following areas are recommended areas to scout and do not guarantee success. Areas: Some scouting options include the Pinal Mountains, Apache Peaks, and Timber Camp Mountain. Areas near Timber Camp include the southern slopes found along F.R. 303 and the northern hills F.R. 304. The different canyons, drainages, creek bottoms, and saddles can provide opportunity in those areas. One access point to Apache Peaks is to take the Wheatfields exist east of Hwy 188 and follow the road until you see Hicks Rd on the east side of the road. Take it and follow it until you pass HE Ranch on the west side of the road. Take the road to the junction of FR 219 and FR 220 (Richmond Basin rd) on the east side of the road. You can follow this road (FR 220) to the south slopes of the Apaches Peaks and glass the slopes, saddles, and drainages. The season dates are valid only until the female harvest objective is reached, after which time the season closes at sundown on the Wednesday immediately following. Hunters are responsible for checking to see if the hunt is still ongoing before they go afield. Season status must be checked by calling 1-800-970-BEAR (2327). Hunters are also required to contact the Arizona Game & Fish Department in person or by phone at the same number within 48 hours after taking a bear. In addition, a physical check-in must be done for each bear taken by a Arizona Game & Fish Department qualified employee within 10 days after contacting the Department. Overview: The mountain lion population in this unit appear to be stable, with lions immigrating and emigrating to and from the San Carlos Apache Indian Reservation. To increase success, hunting with dogs is recommended, however, if you use a guide be sure they are licensed with the state and that they have the proper permits for guiding on Federal Land. Keep in mind that the following areas are recommended areas to scout and do not guarantee success. Areas: Mountain lions are found throughout the unit wherever prey is plentiful. Lions are primarily nocturnal and prey on species such as deer, domestic livestock, javelina, and other small game. Glassing lions will be a challenge in its own due to the rough areas they live in such as rugged canyons and dense ridges. Lion tracks and sign can be located along forest roads and trails, as they seek easy walking when moving from location to location. Overview: The elk hunt in this unit is a Limited Opportunity hunt and is managed entirely as a Limited Population Management Zone. Based on observations of elk in the northeast portion of the unit, there is enough elk to provide an opportunity while supporting the management objectives. This hunt will help limit elk competition with mule deer and whitetail populations. Also, a large portion of the population in the unit is influenced by immigrating and emigrating elk from the San Carlos Apache Indian Reservation. Keep in mind that the following areas are recommended areas to scout and do not guarantee success. Areas: Due to very low populations in the unit, the best places to consider would be Timber Camp Mountain, Carol Spring Mountain, and the Apache Mountains. To access Timber Camp Mountain and Carol Spring Mountain from Highway 60, head north on the N77/E60 (Show Low Highway) for about 25 miles. Once you top out, Carol Spring Mountain is on the east side of the road and Timber Camp is on the West. To access the Apache Mountains, head north on N77/E60 (Show Low Highway) for about 10 miles and most of the access roads on the west side for a few more miles lead to the base of the Apaches. All of these areas are North/Northeast of Globe. Scouting is highly recommended due to very low numbers of elk. Overview: Hunters can find cottontails just about anywhere in the unit from the pine forest on the Pinal Mountains to the deserts in the southern portion of the district. The deserts in the southern portion of the district will have higher densities of rabbits. The northern area of the district does have rabbits but the dense underbrush may keep the hunter from being successful in this or her attempts to harvest rabbits. Keep in mind that the following areas are recommended areas to scout and do not guarantee success. Areas: A couple of suggestions in the desert include the area east of Superior and the area of Drippings Springs should provide the hunter the best chances to take some rabbits home. As always early mornings and late evenings provide the best time to see and harvest rabbits. Overview:There are very few tree squirrels in Unit 24A. There is a small population of Abert’s squirrels in the Pinal Mountains South of Globe. The top of the mountain is the only place where a hunter can find squirrels with any success. However, due to the presence of several homes, USFS campgrounds and mountaintop radio towers with often-occupied buildings, finding an area to hunt beyond the one-quarter mile limit can be challenging. Prospective hunters should also learn the main road to keep from shooting towards or across a road. Overview:Unit 24A has a viable population of Gambel’s quail. Keep in mind that the following areas are recommended areas to scout and do not guarantee success. Areas: Gambel’s quail can be found anywhere within Unit 24A. Some suggested areas to consider include Drippings Springs south of Globe, Horseshoe Bend North of Globe, and 7-Mile Wash North of Globe. The Dripping Springs area has a high density of cholla cactus, which can be hard on dogs and hunters that have not hunted this type of vegetation before. Look for quail in canyon bottoms and in areas near springs and waterholes, especially in arid habitat. Climate data are from Globe. At higher elevations in the unit, an average of 2 to 4 inches of snow falls during the months of January, February, and December. Tonto National Forest administers Sulfide del Ray (elev. 6,000′),10 miles southwest of Globe; Pinal Mountain (elev. 7,500′), 15 miles southwest of Globe, drinking water available May-Nov.; Pioneer Pass (elev. 6,000′), 9 miles south of Globe; Icehouse CCC (elev. 4,000′), 6 miles south of Globe, barrier-free access; and Jones Water (elev. 4,500′), 17 miles northeast of Globe, barrier-free access. Elevation ranges from 2,000′ to 8,000′. Terrain is mountainous and characterized by very steep slopes. Vegetation varies from Sonoran Desert palo verde to mixed conifer, but is primarily thick stands of scrub oak and manzanita. Scouting is a must in this unit. The steep terrain and thick vegetation make traversing the unit and finding game extremely difficult. The unit is not recommended for inexperienced hunters. Keep in mind that the suggested areas above are just suggestions about the unit to scout. There are other areas in the unit one can try, but scouting and research is recommended.